Always helpful and prompt. I usually got a response on their Q&A board within the same day I asked it, and if not within the same day, by the next business day. They always answered my question in detail, were polite in their communication, and very professional. Easy. I used PayPal and it took no time at all. I had no problems and my payment was received the same day. About 47 business days. It shipped on December 7th, and it had arrived to me by December 12th. I do. My boy came to me with his seams sanded and all, which I was not expecting after seeing a friend receive a doll from another company on the higher end of the price range. His resin is smooth and soft to the touch. His face-up is beyond my expectations, and his body is beautifully detailed and sculpted. Although I would prefer a double-jointed knee on my doll for the price, he still poses well. He is my first SD, so I have little experience with what is common for them, but I think he's a high quality doll. For the most part, yes. There were differences, obviously, due to my different face up, but I think he is even more attractive than the photos. There are details in the face up, such as the slight sparkle Crobi applies, that just don't show up in the company photos. More than satisfied. However, there was a problem. Probably due to careless handling, my doll came to me with pieces broken off of his thigh parts. I took photos as soon as I opened the box and sent them to Crobi, asking if there was any way they could send me replacement parts. This was on Monday, December 12th. They got back to me within 2 hours and said they would send replacement parts right away. I e-mailed them back to ask if they needed additional photos or anything to let me know, and they said that was not necessary and they would send the replacement parts by the end of the week. I had them by Saturday, December 17th. They were carefully wrapped with lots and lots of bubble wrap, and Crobi packed them with some little stickers with drawings of the recently released basic and winter limited dolls. Super cute. Yes! I would be happy to order from them again. I'm quite impressed with them. Possibly. If it would save me money, then yes. If not, I think I would just go ahead and order a new doll from Crobi. It was such a good experience. * What did you order? DD Tei, blank. * How was the communication? Very good. I purchased some other things after that and they combined my orders adding a small shipping fee. * How easy was it to pay? Very easy, with paypal. * How long did it take to ship? 20 days, really fast! * Did the item look like the sales pictures? Yes, the same. * Were you satisfied with the product? Super satisfied!! Very fast and prompt. They were very detailed and polite when replying back to my question in the Q&A board. About 44 business days. Shipped on Oct 13th and arrived to me on Oct 17th. Yes, it does. As he is my very first doll, the resin was really smooth and nice to touch. For his face-up, I didn't expect it to be so stunning. Despite the fact that he poses really well, I would really prefer the body to have double-jointed knee. I also bought clothes and other stuff for him as well. Overall, I think everything were produced high in quality. Although there were some differences, since I ordered custom face-up, I love it more this way. There were some glitter/sparkle details on the face-up that wasn't shown in the company photos and I really like it. I'm more than satisfied and it's worth it. Yes, definitely! I was quite impressed by their quality and communication, I couldn't be more happy to order from them again. Depends but I prefer purchasing from the company itself. They will also send an e-mail when you made an order, confirmed your payment & sent your goods. 47 business days / 10 weeks [including weekends & holidays]. Yes, if there's anything I want. REALLY FRIENDLY AND NICE !! including the eyes , very ! Didn't need to ask anything. Literally about an hour, it arrived today. always exceed expectations. They are by far my favorite doll company. * What did you order?Lance A type (with faceup), 2 pairs of jeans, 3 pairs of eyes, 2 wigs, 2 necklaces. * How easy was it to pay? Very, by card. * How long did it take to ship? LESS than a month! I was so surprised when they told me my order had shipped on February 12th - I thought it had to be a mistake! * Did the item look like the sales pictures? Better! They added some sparkle to his faceup as well which looks stunning. * What did you order? R Line Zion, blank. * When did you order? 20th March, 2012. * How was the communication? Great! They told me the shoes I ordered had a problem and they offered a refund or changing them for another items. They solved the problem super fastly! * How long did it take to ship? 10 days, sooooo fast! * Was the quality appropriate for the price, in your opinion? Yes, he's amazing!! Very cute and high quality! * What did you order? R-Line Jun, blank. * When did you order? 2nd April, 2012. * How was the communication? Great, as always. * How long did it take to ship? just 2 days... I was so shocked and happy!! * Did the item look like the sales pictures? Jun looks even better in real life, he's a total cutie! * Would you order from this company again? Yes, I love their items and dolls! * What did you order? R-Line Haz, blank. 8-9 sized wig. * When did you order? 19th April, 2012. * How long did it take to ship? a couple of weeks. * Was the quality appropriate for the price, in your opinion? Pretty much. * Did the item look like the sales pictures? He looks more mature in person, IMHO. * Were you satisfied with the product? This time I wasn't as satisfied with the doll as I was with my previous orders. The head is slightly softer in colour than the body and the finish is a little rough. * If you weren't satisfied, how did the company solve your problem? I wrote to them and they said it was, sadly, normal. Not long at long! Shipped the next day. Wig color seemed a bit different in person, but that's normal. * How long did it take to ship?-Very quickly! I received it in three days. * Was the quality appropriate for the price, in your opinion? -Definitely! * Would you order from this company again? -Absolutely! Shipped on the same day and arrived before I even thought to look up the tracking number, within a week I think. For the wig, yes. Shipping costs surprised me a little. Yes. The colors might be a little different in shade, but they were still rich and beautiful. Yeon-Ho with default face-up and an item of clothing. Great, usually within 1-2 working days. Yeon-Ho and the clothing both looked great, even better than the sales pictures. Yes, if there was something I wanted that was no longer sold by the company itself. Other than that, I'd prefer to buy new from the company. Crobidoll YS head via exchange head event. No. I'm disappointed for Crobidoll this time. Photo & drawing comparison. I make drawing to show problem clearer to Crobidoll. Since photo is hard to see. Not at all. As mentioned, there is a big different mouth from the original YS head. Not for this time. I'm very disappointed with the quality and a flaw on lips. 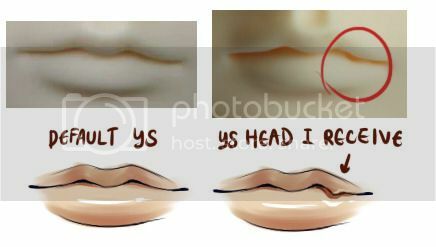 Firstly, Crobidoll told me they cannot exchange new head replacement because all of YS lips are the same (before I sent the head to them). And another option to send the head back and they will refund shipping + head price and send my own old YS head to me. At first I accept the new head and think I will do modding myself. But when I check head again, it's too hard to mod and I don't want damaged head. So I asked them to return my own doll head, and explain what happen to the new head parts I received (a flaw head). [Edit.] After I discuss with Crobidoll in many emails, ship the head back, after they received the package, they confirmed me it is a defective head parts and it was their misunderstanding before (because in photo it's hard to see the flaw for them). They even offered me to cast a new head for me to select before they received package. After the new casting was done, they sent me a photo of new head, which is beautiful and flawless! So I confirm for the exchange part. I'm in love with Crobidoll's amazing customer service! They're very, very nice to deal with! After all amazing customer service, yes. Maybe. Though I prefer to buy directly from a company if possible. Super easy, just used paypal as usual. Just a few days. I got a "missed parcel notification" from my mail carrier when I got back from my weekend trip on Monday afternoon. Date of the notification was on the 5th, I got the parcel on the 7th. I think so! There were a few loose hairs that have come off the wigs, as well as a few sprinkles of cut hairs (which I assume just didn't get shaken off properly at the factory or something), but not falling out in clumps. I'd say about 3-4 hairs per wig the first time I put them on. I've taken all three off the dolls and put back on and no extra hairs have fallen out. There were a few kinda funky curled up hairs that I simply trimmed off too, but nothing terrible. Also on the CRWL-60 you can see the wig cap a little if the hair is displaced but nothing too bad, plus the cap is dark so it's not horribly noticeable. Very much so! The wigs look wonderful and are very soft! I'd love to get some more Crobidoll wigs!! Definitely! I'd love to get some more wigs from them as well as a few of their dolls! I love Yeon-Ho and Tei!! Very good! I added 3 extra orders throughout my waiting period and they combined everything without a problem. Yes, I think so. A little expensive, but high quality. It's been about 8 months. * How easy was it to pay? Easy. I visited their offline store. * How long did it take to ship? Instant. I visited their offline store. * Was the quality appropriate for the price, in your opinion? Yes. The price was a bit high but the quality was superb. Loved the wig. * Were you satisfied with the product? Yes, very The best quality wig I've ever bought. As for the wine glass, so-so. * If you weren't satisfied, how did the company solve your problem? I didn't contact them later. * How was the communication? Very good. They answered my question and were very friendly. * How easy was it to pay? Paypal. Wicked easy. * How long did it take to ship? Nov 4, so barely a month, including weekends. * Was the quality appropriate for the price, in your opinion? Yes, she's lovely. Beautiful, flawless faceup, great resin quality, no scratches, minimal seams. * Did the item look like the sales pictures? Yes. A bit girlier than the sales pictures, perhaps, but really just like them. * Were you satisfied with the product? Yes. Her eyes don't turn like the ones in the company photo do because of the link in her head- but that is a minor problem that I'm not worried about.